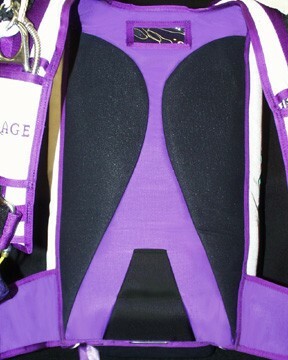 Description: Exactly 4 years after the introduction of our innovative G3 container, Mirage Systems is very proud to introduce to you the latest generation of skydiving technology, Mirage G4. improvements. The tapered main is easier to pack because the bag rotates more easily into the pack tray than it does into a flat main container. The tapered semi-split deployment bag also makes it easier to control the main while packing, yet opens fully on deployment. Down the side of the G4 we have made our secondary riser covers even more complete by designing them to actually tuck into the backpad underneath the reserve, for the most secure riser stowage ever offered. The backpad itself has been redesigned with an attractive look and better padding. The deluxe backpad option is therefore not offered on the G4. 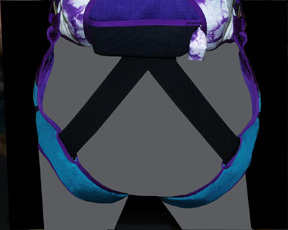 Elastic lumbar support has been added at the hip to comfortably snug the rig to your lower back without cutting into you. 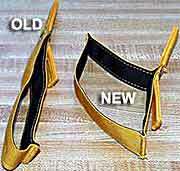 The optional new FancyPants elastic legstrap retainers keep the legstraps from slipping down your legs while bending at the waist. All elastic components are easily field-replaceable. 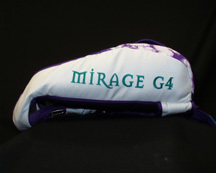 Mirage Systems has made a number of improvements to the G3 container system for the model year 2002. All improvements are included standard (whenever applicable on optional equipment) at no charge. On all Velcro™-less risers we have instituted a simple, Velcro™-less excess line keeper system. The system is easy to use and has no "moving parts" to wear out. This eliminates a common problem with such risers, unsowed excess free brake line. Also on all Velcro™-less risers we introduced a new toggle design that "presents" itself better to the user on opening by springing open to produce an easily grasped profile. 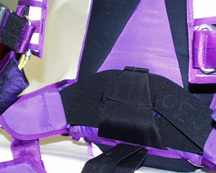 This enables the user to be "on toggles" faster after opening and to generally reduce fumble time any time the toggles are re-gripped under canopy, giving the user more time to watch where he or she is going. For those selecting soft reserve ripcords, an increasingly popular item, we have modified the handle by introducing a stiffener plate between the handle attachment strip and the handle pad. The stiffener forces the handle to lie flat with the main lift web. This prevents the possibility of the handle "rolling under" the main lift web and becoming inaccessible. For sit-fliers, bum strap attachment points are now included on every rig, so fitting a bum strap in the field is very simple. Finally, we have introduced a modified version of our cutaway housing end-fitting. The original version was designed by the US military and has served reliably on over 15,000 rigs for over 10 years. The new version has been modified to provide even smoother cutaways under the most adverse conditions, while still providing the structural integrity of a one-piece cast stainless steel fitting.